As you can tell Jordon has been a binky maniac. It was his best friend, and frankly could solve any problem in life. Well, he lost it. Of course I would have been willing to go and get ten more, but Joel insisted otherwise. He is too old he says. I say he is so cute with it. 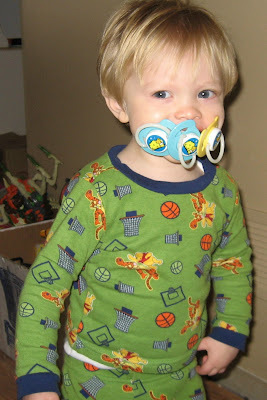 Getting rid of the binky means he is getting older and turning into a little boy. This of course means that I too am getting older. Well, the past four days Jordon has been binky free! The first two nights it was nothing but screaming and crying. I don't think I have ever heard the phrase " I want my binky" so much in my life. Finally by the third day he forgot all about it. Occasionally I will find him with Brianna's binky in his mouth and he just smiles. I did, however, finally find his binky today. It was behind his carseat in the car. I was so excited I almost shouted " Look what I found!" It was probably a good thing I didn't. I will miss the binky, but I won't miss the midnight hunt for it. This is a good lesson for me. My older two children never took a pacifire, but the babies do. And I have been dreading how I have to take it away. I know, they are only 10 months, why am I stressing? But that is me. Anyway, I am glad I read a story about it so now I know that cold turkey is not all that bad, just for the first 2 days.